This week, our campaign to pass the Right to Know Act in the NYC Council was featured in a Wall Street Journal article that focused on the support it has gained from a majority of council members – enough to pass the bills. It also highlighted resistance from NYPD Commissioner Bratton and Mayor de Blasio, and their misguided preference to let the NYPD pick and choose limited administrative chagnes rather than support common-sense legislation that would create real change. We know the NYPD disregards their own rules with little-to-no consequence and there would be nothing to stop a new mayor or police commissioner from simply abandoning those types of changes. The only way to create lasting changes with these reforms – endorsed by the White House Task Force on 21st Century Policing – is by passing the Right to Know Act into law. With the legislation continuing to gain momentum, Commissioner Bratton chose to personally attack council members rather than face the discrepancy between his claims of support for their policy goals and opposition to making them enforceable. We responded strongly to the commissioner’s attack on NYC Council members and their role of legislative oversight. We will continue to gather support for the City Council to pass the Right to Know Act to bring accountability and transparency New Yorkers’ everyday interactions with the NYPD. Today, Friday, November 20 marks one year since Akai Gurley was shot and killed by NYPD Officer Liang while simply walking in a stairwell within the Pink Houses in East New York. 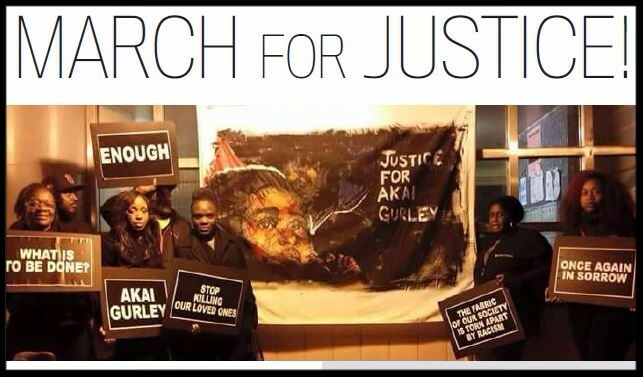 At 6:30 pm today, the family of Akai Gurley, leaders from Malcolm X Grassroots Movement, CAAAV, & other community groups will gather at the Pink Houses in Brooklyn to remember Akai and call for justice in his killing and systemic changes to end police brutality. For more information on joining them in taking action, click here. The fight for trans liberation is deeply embedded in our work to #changetheNYPD. As LaLa Zannell from the NYC Anti-Violence Project testified before a congressional panel this week, at least 22 trans and gender non-confirming people have been murdered in the US this year alone. Yet when trans individuals, particularly trans people of color, engage with law enforcement for help, they are 6.2 times more likely to experience police violence. During this #TransAwarenessWeek, we honor the leadership of the trans* community in the fight for justice and safety in New York. Their work to support police reforms and build alternatives for safety that are rooted in community power and love is vital. We encourage you to share this powerful Know Your Rights video --The Real T: This Is My Truth:-- created by trans & gender non-conforming youth at Streetwise & Safe, with support from the Global Action Project. Help build the movement to #changetheNYPD. Forward this email to a Friend. We look forward to strengthening this movement for justice with you!